Every once in a while, it’s discovered that a staff member at Goshen College has an alternate identity. Pamela Osborne, the help desk manager at ITS, is one of these people. In addition to saving the lives of people unfortunate enough to encounter the many faults of modern technology, Osborne is the founder and owner of Juxtapose, a vibrant art gallery and shop in downtown Elkhart that displays everything from sculptures and paintings to handmade jewelry and chocolates. Osborne grew up in Upland, Indiana, living there through high school. After graduating, Osborne attended Indiana State University for two years. “The program introduced students to many disciplines before they picked a concentration for a major, so I took art history, painting, photography, metal design, graphic art, drawing and 3D sculpture,” said Osborne. After two years at Indiana State, Osborne decided to pursue a career in fashion design, moving cross-country to Los Angeles, California to attend Glendale College. There, Osborne earned her degree in fashion design and pattern making. “When I lived in Los Angeles, I was a buyer for a chain of stores and worked as a retail manager,” Osborne said. She soon grew to enjoy the retail experience, but she always dreamed of something bigger. “I was always promoting someone else’s idea. I wanted to create my own concept.” In 2008, 12 years after moving back home to Indiana, Osborne decided the time was right to pursue her long-standing goal of opening her own shop. “[I] was looking for a way to augment my income and decided to take the leap,” she said. As it turns out, that leap would take eight years of hard work. “It took years of planning to find the right location and renovate the building my husband and I bought,” Osborne said. 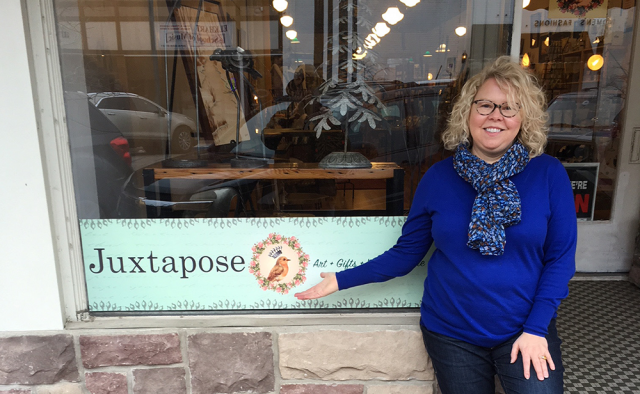 Finally, in June 2016, Juxtapose opened for business at 208 South Main Street, Elkhart. According to Osborne, the name of her shop originated from a lesson she had learned from a friend years ago in Los Angeles. “A friend of mine who I went to Glendale with opened a store featuring maternity wear,” said Osborne. But after expanding her store to sell kitchen towels and other additional merchandise, the store fell prey to the scrutiny of ever-vigilant Yelp reviewers. “People on Yelp said the store had an identity crisis,” she said. Determined not to fall prey to the hordes of pedantic internet reviewers, Osborne decided to name her shop something that would allow her to freely change and diversify the store’s products. Thus, Juxtapose was born. “Juxtapose allows me the freedom to mix many things in one space, and the name [remains] appropriate,” she said. Today, Juxtapose features the work of around 25 talented local artists, and amongst the slew of colorful sculptures and paintings occasionally lies the work of up-and-coming GC artists. “In May Term, we have an open house the last day of sculpture class,” said John Mishler, associate professor of art at GC. “Pamela came last year and then invited us to show in her gallery during the Art Walk,” he said. Getting their work presented to the public provides the students with increased motivation. Mishler also said that Osborne has given students the priceless gift of feedback on how to put a price on their artwork. “It was really foreign to have that experience,” said Andrew Nussbaum, a senior TESOL major at GC, who last year had his art displayed at Juxtapose. “It’s interesting to think about how your art is going to present itself to other people. You wonder how the piece is going to fit into the gallery,” he said. Together, Mishler and Osborne have taught students the ins and outs of presenting something as personal as art for the local community to enjoy. Thus far, the partnership has resulted in multiple students not only displaying their work but also several students earning a surprise paycheck. Just recently, Nussbaum and fellow GC creatives, Rachel Yoder and Orion Blaha, have all sold art at Juxtapose. As it happens, Nussbaum’s piece, an abstract collection of metal triangles titled “Directionally Everywhere,” sold for over $300. But of course, none of this would be possible without the work of GC’s multitalented ITS helpdesk manager, just another example of why students should always keep an eye out for GC’s staff’s alter-egos. great article, thank you. we are waiting more article from you about music and mp3. Thank you sir, great post.